BT Sport Ultra HD: What is it? How can you get it? | What Hi-Fi? BT Sport Ultra HD: What is it? How can you get it? BT Sport Ultra HD was the UK's first broadcast 4K TV channel. So how can you watch it? And what can you watch on it? Allow us to explain. The 4K TV revolution is finally gathering pace. Though the first 4K Ultra HD TVs made their way into shops a few years ago, it's only now that there's a decent amount of 4K content to watch on them. Sure, 4K films and TV shows from Amazon, Netflix, YouTube and the like are good, and more films are being released on Ultra HD Blu-ray. But broadcast content is arguably the easiest way to bring Ultra HD to the mainstream. The basics: BT Sport Ultra HD was the UK's first 4K TV channel. It launched in August 2015 (a full year ahead of Sky Q's 4K service). Its first live 4K broadcast was the FA Community Shield match between Arsenal and Chelsea. Ultra HD promises "four times the detail" of HD, delivering video content in a resolution of 3840 x 2160 (sometimes known as 2160p), compared to that of Full HD in 1920 x 1080 (1080p). Higher resolution equals more information, which translates to a more detailed picture. Expect to see sharper edges, more detail in crowd scenes, more realistic faces, and so on. The 4K content is delivered at 50 frames-per-second, which helps fast-moving action such as sport, and with 10-bit colour depth as opposed to the 8-bit used in HD video. This broader palette of colours again makes for more realistic, more colourful and more vivid pictures. What does all this equal? As BT puts it: "Unbeatable picture quality". So if you're used to BT Sport HD or even Sky Sports HD, then expect to see a leap in picture quality. BT Sport Ultra HD also offers better sound quality than rival channels. At the end of 2016, BT announced it would add Dolby Atmos to the channel, making it the first broadcaster to support the format. Dolby Atmos aims to take surround sound a step further, and make it completely envelop the audience, making for a much more immersive viewing experience. You will need a compatible amp and speakers to notice the difference, though. From now on, every Premier League game shown on BT will be in 4K with Dolby Atmos. While BT Sport Ultra HD might be the first broadcaster to use Dolby Atmos, it won't be the only one. Sky recently revealed it will add the technology to its Sky Q package, though it hasn't yet announced when. 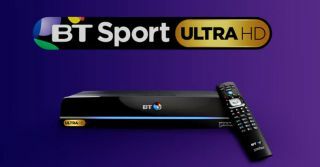 How can you get BT Sport Ultra HD? BT Sport Ultra HD is only available if you have BT TV. To access it, you'll need to add the BT Entertainment Ultra HD package to your subscription. The Entertainment Ultra HD package isn't cheap, costing £21 per month extra (£14 extra for existing BT customers who are upgrading), plus one-off fees of £44 (though it's currently on offer for £20) for an engineer installation and £50 for the new YouView Ultra HD box (worth £250). On top of that, there's a £10 delivery charge. The BT Ultra HD box has a 1TB hard drive and the package gives you access to "60 premium channels" of HD and SD content. You'll also need a BT Infinity broadband connection. BT says the service requires a 44Mbps connection, "which ensures a high quality TV viewing experience and concurrent internet usage". Lastly, you'll need a compatible 4K TV, of course. Most TVs released from 2014 onwards from big manufacturers like LG, Panasonic, Samsung and Sony will be supported. As we noted ahead of the launch, BT Sport won't support older 4K TVs and products due to changes in the 4K spec over the last couple of years. This includes many 2014 AV receivers, with only Onkyo delivering AV amps with the necessary HDCP 2.2 spec. There's no way to watch BT Sport Ultra HD online, on a laptop or on mobile, as you need a set-top box. So you'll have to pay for the full subscription, we're afraid. What's on BT Sport Ultra HD? Football is the main draw. The channel shows matches in the Premier League, FA Cup, UEFA Champions League and UEFA Europa League in Ultra HD. However, while BT has exclusive live rights to the Champions League and Europa League, it only holds the rights to relatively few Premier League games, compared to Sky which has the lion's share. In December 2016, for example, BT showed seven Premier League matches live, whereas Sky broadcast 16 (and just like BT's, they were all shown in 4K). BT also shows other live sports in 4K, including Aviva Premiership rugby, MotoGP and squash. Generally speaking, there are a handful of live sporting events shown in 4K on the channel each week. To plan your viewing, take a look at the schedule (channel 433 on the planner). What about 4K on Sky? Virgin? BBC? BT might have launched 4K first in the UK, but Sky and Virgin Media have soon caught up. Sky launched its 4K service last summer - a good six months after Sky Q launched - while the 4K-capable Virgin TV V6 box was announced just before Christmas. This season, Sky offers 124 of its 126 Premiership football matches in 4K, alongside films, dramas, natural history programmes and documentaries. Every race from the 2017 Formula One season will also be shown in the resolution. To watch, you'll need the Sky Q 2TB box (known as Sky Q Silver at launch) and a subscription to Sky Sports. Virgin Media also offers 4K to its customers, through its Virgin TV V6 box. However, at present it only offers Netflix and YouTube in 4K - the 4K action from Sky Sports and BT Sport is exclusive to those providers.